Hey look, another new feature based on user feedback! I’ll be honest, I never considered this because I track so few books, but for those publishers or crazy productive romance novel writers tracking TONS of books, there is now a way to quickly sort the books on your User Page. Your default sorting preferences have been added as an option in Account Management! 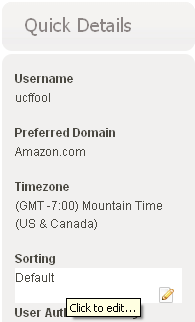 Simply click on the Sorting section and choose which option you would prefer. Once chosen, click Change to save your changes. 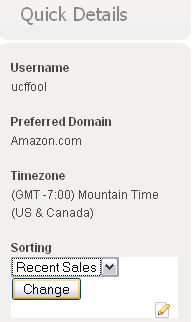 When you return to your User Page, it will now display using your selected Sorting order! This entry was posted in News and tagged user pages on September 2, 2010 by Mario Lurig. There is a half-second delay before the pop-up appears to ensure it doesn’t happen accidentally. It will also disappear when you leave that current book’s row, automatically. This request was one of the top request on the user page feedback survey, found on the left side of your user page. If you haven’t filled it out or if you have and you want to change your answers, you are more than welcome to do so. 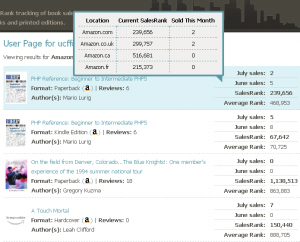 As a space consideration, book sales in the table only show the current month. Like this feature? Consider donating to support the 2010 donation drive. This entry was posted in News, Tips and Tricks and tagged user pages on July 14, 2010 by Mario Lurig. Problems with Adding Books to User Pages? What is the search term you are using to find the book? What is the exact title and format of the book that was found (and you want to add)? What error message do you receive or what event occurs? Send me an email with the above info:admin@novelrank.com. Thanks for helping NovelRank become a better service. This entry was posted in Authors and tagged bug, user pages on June 29, 2010 by Mario Lurig.